Advantages: Pre-painted and in perfect register, easy to manipulate, variety of belts represented. 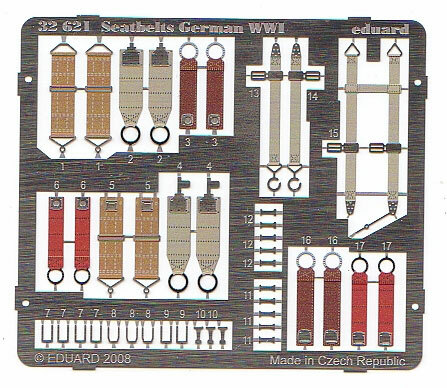 Conclusion: A simple and trouble free way to add coloured seatbelts to your World War I aircraft. A spate of World War I aircraft has been released in recent years. Making or painting realistic seatbelts for these machines can be a real chore. 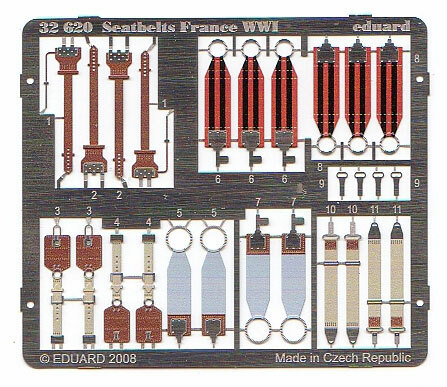 Eduard now gives the modeler a helping hand with a set of pre-painted items in two popular scales…1/72 and 1/32. The former size concentrates on those aircraft of German and Austro-Hungarian origin. There are examples for both single and multi-seat planes with both lap and shoulder belts represented. Multiple copies of each type are present which adds to the value of the product. As with the other releases, the colour printing on these frets is excellent and there were no registration problems at all. This larger scale has fewer items per package but they are no less impressive. In fact here we find details on both sides of the belts. So along with the buckles, the colour printing is duplicated which really is an outstanding feat. Each set covers both the early and later war period and in all but one case, at least two of each style is provided. Regarding the German items, we once again find an assortment of lap belts and due to space, a single example for over the shoulder. The variety means that at least one type will be suitable for your preferred fighter, bomber or reconnaissance aircraft. The French pieces are all for the lap and five different styles present themselves. 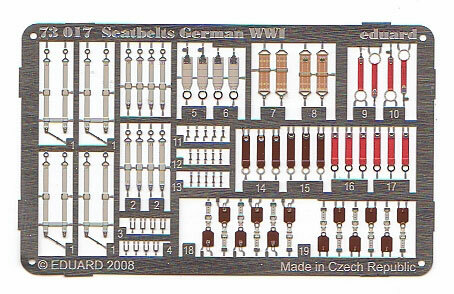 Most of the World War One aircraft kits today lack etched metal parts. To add extra detail the modeler is forced to do it themselves or buy a readymade item. These pre-painted seatbelts are perfect for the job. They can be weathered to suit the aircraft’s appearance and are easily bent to the required shape. Whatever your scale, these releases will make your modelling task that much easier.